"Private Certification as an Alternative to Occupational Licensing"
One of the most effective ways to improve the economy is to decrease government oversight in the private sector. Mercatus utilizes research and analysis to argue for a private solution to occupational licensing. "Does Regulation Breed Financial Illiteracy?" Cato's Diego Zuluaga contends regulation is a significant factor behind average citizens knowing very little about how to invest and manage their personal finances. "Candy-Coated Cartel: Time to Kill the U.S. Sugar Program"
The US Sugar Program is an ongoing example of restrictive USDA and Department of Commerce policy, benefiting a small, but active, lobby while increasing the price of sugar in the US. The Cato Institute details the crony capitalism surrounding the Sugar Program, arguing for abolition of the anti-consumer, pro-lobbyist regulations. "When did making customers happy become a reason for regulation or breakup?" The AEI argues against regulations on social media outlets, focusing on consumer choice in the market, instead of government interference. "Here We Go Again: Steel and Aluminum Tariffs and Peter Navarro"
The CEI published this article last week discussing recent trade regulations passed by the Trump Administration. Along with giving an overview of the impacts of the new tariffs, Ryan Young analyzes and debunks the arguments of Peter Navarro, the President's chief apologist for protectionist trade policy. "Mick Mulvaney Right To Rein In CFPB"
Over the past decade, the Consumer Financial Protection Bureau, an independent agency of the US government, has vastly expanded its regulatory reach and cost to taxpayers. Jamey Bowers reports on Mick Mulvaney's commitment to lessening the regulatory power of the CFPB while simultaneously placing it under Congressional authority. "Be Grateful for 'Big Tech'"
As the influence and size of major tech companies grows, some critics have labeled companies such as Google, Apple, Facebook, and Amazon as monopolistic and out of control. While the major tech companies are significant in market size, Robert D. Atkinson argues against demonizing Big Tech's hold on the market to the point of government regulation. Instead, Atkinson points to the ability of companies to compete in the market through innovation as proof of the private sector's ability to regulate itself. Video of the Week: In this video, political columnist and Reason Magazine contributor Kristin Tate explains the myths behind efforts to regulate the use of plastic straws. Video of the Week: In this video, the Federalist Society examines the negative incentives for regulators when implementing rules on the market. Video of the Week: In this video, PolicyEd discusses how Congressional and Judicial decisions have granted federal agencies a considerable amount of power, but what steps can be taken to rein in the Administrative State. Washington, DC - FreedomWorks calls for government restraint in wake of Comcast’s recent all-cash proposal to acquire Twentieth Century Fox. Echoing our comments regarding yesterday’s DC District Court decision to approve the AT&T/Time Warner merger, American consumers stand to benefit the most from free market decisions and competition between private firms. With the recent passage of S.B. 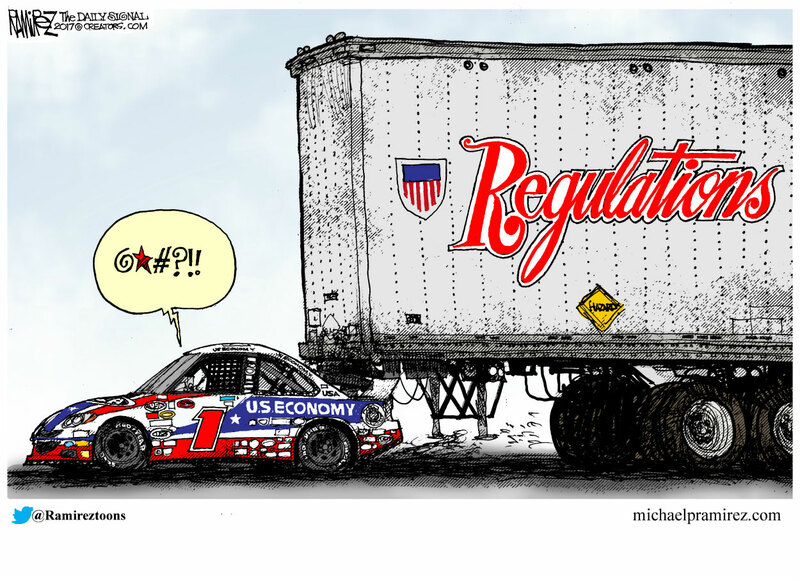 2155, or the Economic Growth, Regulatory Relief, and Consumer Protection Act, President Trump’s campaign promise of Dodd-Frank reform became a reality. While FreedomWorks commends the work done to roll back Obama-era government overreach, the task of freeing the banking market is far from over. One of the more onerous provisions of Dodd-Frank, The Volcker Rule, described by George Mason University’s Mercatus Center as “fundamentally flawed”, is still in place.